Two-piece Economy Rain Suit. Zipper closure with store flap. Attached hood withdraw cord. Vented back and underarms. Elastic waist pants with snap fly. 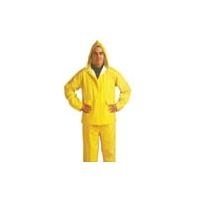 wo-piece Economy Rain Suit. Zipper closure with store flap. Attached hood withdraw cord. Vented back and underarms. Elastic waist pants with snap fly.